Flora Micro is one of the three fertilizer component that belongs to Flora Series from General Hydroponics, a complete fertilizer for Cannabis plants. You can get FloraMicro individually or form Tripack Part One. FloraMicro is one of the three fertilizer component that belongs to Flora Series from General Hydroponics, a complete fertilizer concept divided in 3 complementary components. If you combine these three components you will greatly increase the performance of Marijuana plants. Flora-Series is the result of 20 years of research, experimentation and use, designed by Carl Herrmann, formely chemical of the NASA and the Berkeley University in California. This system formed by three components allows to control the growth of plants. A combination that allows to mix a wide range of several nutrient solutions being dynamic and self-regulatory. The remarkable synergies established between these 3 fertilizers makes them strongly recommended to be used as a single fertilizer. Specifically, Flora Micro provides to Marijuana plants a great amounts of nitrogen and calcium as well as other microelements and essential trace elements in the chelated form. 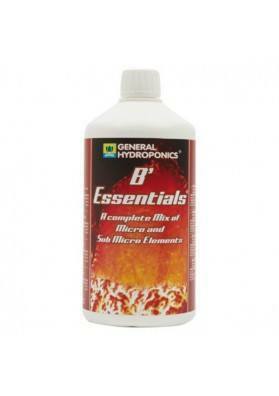 It also incorporates pH stabilizers for the nutrient solution thus increasing the availability of minerals. For an easier use, there are clear indications on the label. FloraMicro can be bought individually in 1L bottles or as part of Tripack One Part, a starting pack from Flora Series consisting of FloraGro, FloraBloom and FloraMicro.